As Christmas draws near, the start of Spring Training inches ever closer. While a lot of action has already occurred this offseason, there may still be quite a bit more to come. As the calendar turns from December to January, needs become more urgent and teams start to get more desperate. While there is still a lot of action to come, up to this point there have been several teams that have come out so far as the big winners of the offseason. These are the five biggest winners up to this point in the 2015-2016 offseason. While the Phillies are obviously in a clear rebuild, and won’t be competing next year or really anytime soon, they still have made a lot of smart decisions so far this offseason. The Phillies began their rebuild in earnest with the trade of Cole Hamels at last year’s trade deadline, and they have so far built well on that foundation this offseason. Despite their lack of activity overall, the Phillies have made several very smart moves this offseason. Tops on that list, is the trade of Ken Giles. Even though Ken Giles was good, arguably great, for the Phillies last season, and was under team control for the next five seasons, an elite closer is a superfluous piece on a team that is not a contender and will not be anytime soon. It made complete sense for the Phillies to cash in on Giles now, before his value could diminish due to decline or injury. And cash in did the Phillies ever. For an unnecessary elite closer, the Phillies got pack four pitching prospects, who all have varying levels of upside. Vincent Velasquez was obviously the prime piece in this deal, but Mark Appel, Brett Oberholtzer, and Thomas Eshelman are no slouches either. At worst, Velasquez should be able to achieve Giles value or close to it. At best, the Phillies have three to five long-term rotation/bullpen pieces instead of just one. While obviously not as big as the Ken Giles trade, the Phillies made several other smaller moves that could pay big dividends going forward. With a void in the bullpen left by Giles, the Phillies went out and signed several former big league closers, in Andrew Bailey and Edward Mujica, to add to David Hernandez who was signed earlier in the offseason. These pickups represent low risk, high reward potential, because if any of these players regain their past performance, the Phillies could use them as trade chips this summer and get back even more value. Another team clearly in a rebuilding phase that has done a great job so far this offseason, is the Atlanta Braves. Following the big time trades of Craig Kimbrel, Jason Heyward and Justin Upton last offseason, the Braves finished as one of the worst teams in all of baseball in 2015. The mission was clear however, and the Braves have taken yet another step to their long-term goal of competing in 2017 when their new stadium is ready to be opened. The Braves have once again dipped into their Major League pool of talent, in order to improve their prospect depth, and their long-term chances of competing. The first big move for the Braves this offseason was the decision to trade Andrelton Simmons. Rumors abounded, and the eventual trade with the Los Angeles Angels came together rather quickly. In return for the young shortstop, the Braves got a short-term replacement, in Erick Aybar, and top Angels pitching prospects Chris Ellis and Sean Newcomb. While this trade was centered around Simmons going to LA, Sean Newcomb could be the real prize of the trade. A potential frontline starter, Newcomb slots on top of the rest of Atlanta’s deep core of pitching talent. Throw in Chris Ellis, and the Braves got two good to great pitching prospects who could make a big impact on the team for years to come. Just when everyone thought the Braves were finished, rumors began circulating about a potential trade of RHP Shelby Miller. Several teams were named in trade talks, but eventually the Braves struck a deal with the Arizona Diamondbacks, who had just signed Zack Greinke and were ready to go all in. In return for the right hander, the Braves got an even better return than they did in the Simmons trade. Not only did the Braves get some Major League talent in OF Ender Inciarte, but the Braves also got former #1 pick, shortstop Dansby Swanson as well as RHP Aaron Blair. Swanson immediately slots in as the Braves number one overall prospect, while Blair is now the Braves second best pitching prospect behind Sean Newcomb. The Braves are now exploring the option of trading Inciarte, and could increase their prospect depth even further. So far, the Braves have clearly had the best offseason of a non-contending team. Now for the teams that actually have playoff aspirations in 2016. In terms of offseason winners, the Arizona Diamondbacks seem to be right on top of that list. Coming off a season in which the D’backs sported one of the best offenses in all of baseball, with one of the worst pitching staffs, it was clear where the upgrades had to be made. The Diamondbacks responded to those needs, and did so in a huge way. In the first move of the offseason, the D’backs signed a big time free agent pitcher. And not just any free agent pitcher. Not only did the Diamondbacks sign an ace pitcher, but they just so happened to take one of the two aces from their biggest division rival in the Los Angeles Dodgers. The D’backs made a huge upgrade to their own rotation, and also dealt a big hit to their division rivals rotation. While the Dodgers still figure to respond with an addition of their own, as it stands the Diamondbacks took a big step forward, while the Dodgers took quite a step back. It turns out that the D’backs were not done after their opening shot of the offseason. To follow the signing of Greinke, the Diamondbacks worked out a trade with the Atlanta Braves, as mentioned above. Arizona gave up quite a bit of talent, in Enciarte, Swanson, and Blair, but got a good pitcher to put behind Zack Greinke and Patrick Corbin in the rotation. After having a top ten offense with a bottom level pitching staff last year, the D’backs may be in the top ten in both categories in 2016. Just ahead of the Diamondbacks, is another team that has made a few big moves this offseason after a disappointing 2015 season. Following another abysmal season in Boston, in which the Red Sox finished in last place in a much better American League East, the Red Sox had two clear needs that needed to be addressed. Those two needs were both pitching related, with the need for an ace and an elite closer readily apparent. In what was the first big move of the entire offseason by any team, the Red Sox signed LHP David Price to the biggest pitching contract in MLB history, at least in terms of average annual value. The Red Sox gave up Price a seven-year deal worth $217 million, with an opt out clause included. After a season in which the Red Sox lacked a true ace in their staff, and struggled through inconsistencies top to bottom in that staff, the Red Sox fixed that problem in one trade. Price slots in as the ace of the Red Sox staff, and makes them a real threat to get back atop the AL East in 2016. 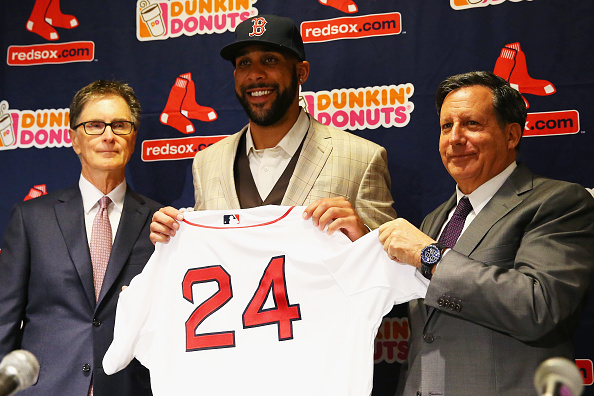 Even with the big signing of David Price, the Red Sox weren’t nearly finished. To follow-up, the Red Sox shipped a package of four prospects to the San Diego Padres for elite closer Craig Kimbrel. After solidifying the top of the rotation, the Red Sox followed by solidifying the back-end of the bullpen. The Red Sox then followed with one more trade, trading starting pitcher Wade Miley to the Seattle Mariners for reliever Carson Smith, putting an exclamation point on what has already been a busy and successful offseason. While several other teams have made big moves so far this offseason, no other team has made as much improvement to this point as the Chicago Cubs. Following a 97 win season in which they made it all the way to the NLCS, after beating both of their division rivals in the playoffs, the Cubs have still done a lot this offseason to get better. While the Cardinals and Pirates have both been mostly idle up until this point, the Cubs have made four big moves to make their team better. Following a playoff series loss to the New York Mets in last year’s postseason, the Cubs knew that they needed more depth in their pitching staff. To solidify the middle of the rotation behind Jake Arrieta and Jon Lester, the Cubs added veteran right hander John Lackey, who is coming off a strong season for the division rival St. Louis Cardinals. Not only does this give the Cubs some pitching depth to take the pressure off Kyle Hendrick and Jason Hammel, but it also deals a blow to the Cardinals 2016 rotation. The Cubs then traded infielder Starlin Castro to the New York Yankees for Adam Warren and a few other parts. This trade not only gave the Cubs further pitching depth in Warren, but also gave the Cubs the room to go out and sign Ben Zobrist. Zobrist slots in as the team’s new second baseman, and is a clear upgrade over Castro for next season. Finally, the Cubs went out and signed Jason Heyward, who is currently slotted in as the Cubs center fielder as a part of their youth movement. More importantly, the Cubs took yet another player from their division rivals in St. Louis. With all the smart moves, the Cubs may have solidified their place as National League favorites, and perhaps, even World Series favorites.